I have been nominated for “The Mystery Blogger Award” by Didi. My most sincere thanks to you dear Didi for this beautiful honor! 01. Place the logo on your blog. 02. Thank your nomination to who nominated you and provide a link to your blog. 04. Mention the creator of the prize and also provide a link. 05. Tell your readers three things about you. 10. Notify the nominees by commenting on their blog. He decided to call the prize “Mystery Blogger Award” because the meaning of his name, “Enigma”, is “mystery”. So it bears the name of its creator. In addition, it is a very appropriate name because there are many blogs that are still a mystery for all of us and when we know them, they result being extraordinary. I was deeply touched by my mom’s spirituality and kindness. I was very lucky to have her, and certainly I can appreciate more about her each day. Even though she is no longer in physical form, she continues to be a great source of inspiration to me! I am really enjoying being a part of this blogging community, and I am a witness of pretty amazing things happening here, when people that think alike bring their positive energy together to become a source of inspiration: the ripples of love and synchronicities begin to spread… I have been very fortunate to be gifted with “meeting” some very amazing people here, and to see the seeds of friendship germinate and start to blossom in a very short period of time!!! My gratitude goes to all of you, old and new friends! 1.) Do you believe in a life after death? 2.) Do you believe that other intelligent life-forms exists? 3.) Do you believe that mankind’s history is exactly as we were taught? 4.) Do you believe that we stem from apes? 5.) Do you believe what governments tell us? Please, state reasons to all 5 questions. Imagine a dime that is 75 feet away from you. Better yet, place a dime on something, walk 75 feet away from it, and look and see how small it is. Now look up into the sky and imagine that dime 75 feet away (up in the sky). Here’s the kicker. 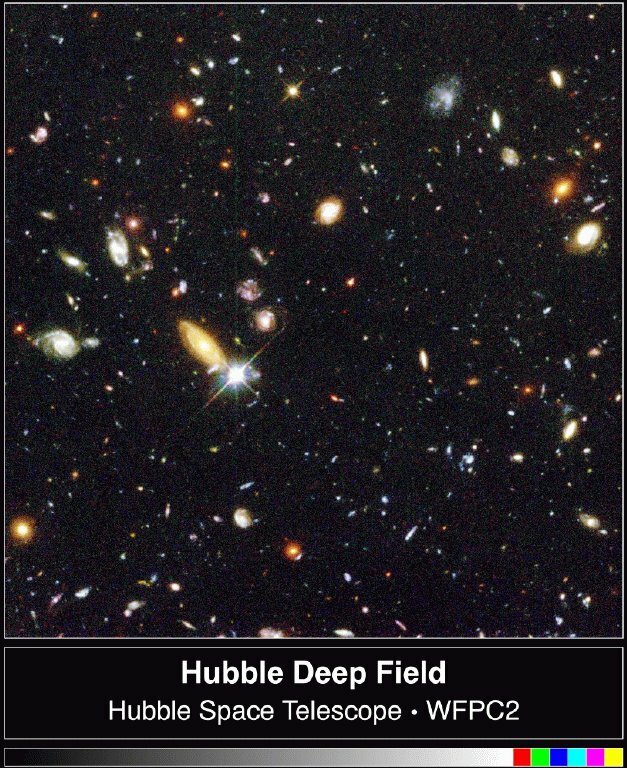 Imagine that there are 1500 galaxies in that little spot of sky. The image at the bottom of this page is exactly that. It is an image of a piece of sky which is the size of a dime held 75 feet away. In that image are roughly 1500 galaxies. In other words, wherever we look around us, our own planet earth, our oceans, and our air, and a whole microscopic world that we are unable to see with the naked eye, it’s all teeming with a diverse forms of life! There are some bacteria in the human body called aerobics and some that are called anaerobics. Aerobics are able to use oxygen, whereas anaerobic bacteria can sustain life without the presence of oxygen!!! There are also some amazing creatures like tiny invertebrates called ‘water bears’ which can survive in the vacuum of space, a European Space Agency experiment has shown. They are the first animals known to be able to survive the harsh combination of low pressure and intense radiation found in space. Water bears, also known as tardigrades, are known for their virtual indestructibility on Earth. The creatures can survive intense pressures, huge doses of radiation, and years of being dried out. There are many mansions or dwelling places in this Infinite Multiverse!!! 3. Do you believe that mankind’s history is exactly as we were taught? Even since I went to school, the constitution of the atom has changed, the DNA is now much more than what we first believed, and Pluto is no longer considered a planet! Despite the new discoveries, I don’t think that history or many of the subjects that we are taught are correct or in other words, “the whole truth”. … which leads me into question #4 Do you believe that we stem from apes? It will soon be 200 years since the birth of Charles Darwin and 150 years since the publication of “On the Origins of Species”. There are many misconceptions around his theory: Darwin’s ‘Origin of Species’ explains how animals adapt to new environments but not how animals “evolved” in the first place. Darwin only had a “theory”: a theory is only a “theory” until is proven to be a fact. Darwin’s theory of evolution does not stand up to logical scientific scrutiny and the newest archeological and biological (DNA studies) discoveries. “The missing link” that connects our human ancestors to the a “common ancestor” where apes and modern humans supposedly derived, has never been discovered! The scientific community remains in a status quo, and is still teaching this theory as the only acceptable theory!!! In many places, students are not allowed to explore other options in their school curriculum!!! It’s time to change the status quo and move on to new theories, in search of the truth! What do you think is the most important force in the Universe? and why? What is one of the greatest lessons you ever learned? If you could give one piece of advice to others that you learned through your life’s journey, what would that be? What helps you to overcome difficult challenges in life? If you could chose only one place that you feel at total peace, which place would that be? Participation is not a must – its a voluntary matter. If you choose to participate I hope you enjoy it! Thank you very much for your profound answers, my friend. Indeed, answers could fill whole books, but in your answers you hit the nail and brought out the essence of it. Not long time ago, I saw a documentary about “Intelligent Design”. They were a number of scientist from many different faculties and they added their special knowledge together and also came to the conclusion (for example in the field of DNA researches) – that we surely do not stem from aps – there were some special differences within the DNA components that would not match a human DNA. Where we really come from is not yet solved and when studying the old Sumerian text that speaks about an Adamu who was created by the so-called Anunaki (Gods who from the sky) – even before it was similarly mentioned in the Bible under the name Adam, where ( in cuneiform text found) also about stories of the Big Flood, again long before the Bible was written – we will find us with a different “reality” confronted. In this connection I would like to recommend the book written by Hans-Joachim Zillmer “The Darvin Mistake”. We humans tend to be too arrogant and take us as the measure of all things. In doing so we make us blind and close our mind towards new ideas, new discoveries and prefer rather to follow well-trodden paths with blinkers on. Thank you dear Amira again for your great effort and attention towards these topics. Have my full appreciation, dear friend. I just read through all of your answers and I am blown away by your thoughtful and intelligent replies to Didi’s profound questions. I am inspired by the beautiful honesty and authenticity with which you answered the questions and will try my best to live up to the honor you’ve given me with your nomination by taking some time to respond in kind to your fantastic questions. Thank you so much sweet Michèle! I will love to read your replies! (again there is no time-limit or pressure). I would also be curious to know your insights into Didi’s questions at some point. He has generated some very interesting conversations here! I am also anxiously waiting for your book to come out so I can read all about your amazing experiences!!! Congratulations my ‘new friend’ Amira, although I’m pretty sure our acquaintance is as old as time! You have given such wonderful, insightful answers and I agree with you 100%. As Michele says, you need to write more and share your knowledge and wisdom with us all… PLEASE!!! Thank you again for the kind nomination!